The short answer is the dog to wait at your left side, then to run in a straight line to the marked area and to lay down in the area, then you walk as instructed by the ring steward and call your dog to you left side and do heelwork (see 'What is Heelwork') until told to halt. There are probably only 3 basic 'types' of sendaway (Back Marker, Box & Run Through), but all those types then also have varying difficulties depending on the type of 'markers' used to define a sendaway area and the distances involved. Each of the 3 types of sendaway area can be defined by a judge using markers, which can be anything chosen by the judge. So a sendaway drop area could have a huge 3' cone(s) or something as little as a tiny short pole(s) as back marker(s), a taped area on the ground or no back marker at all. There could be large front markers and small back ones or vice versa or mixture of both. You never know what markers or type of sendaway you will encounter until you are at the show to see what the judge has chosen to set out. Along with different markers, the distance the dog has to run can vary immensely. The only ruling on sendaway is that nothing can be placed in the path of the dogs sendaway and any marker used must not have moving parts. Once the run out and drop have been completed (as detailed below) then when instructed the dog is to be called to join you in heelwork, which is considered to be like a Class 'A' Recall (see 'What is Recall' page). Handler Commands on the 'Send' ..
use an arm signal as well as a verbal command. Back Marker - Triangular Sendaway .. 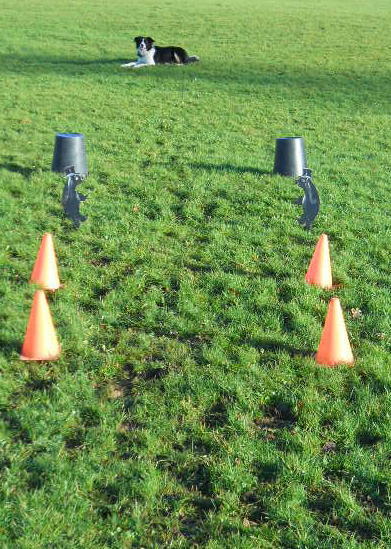 The aim is to have the dog run in a straight line from the starting point to ideally lay centrally across the front of the back marker - in doing so the dog must also run through the centre of the two front cone shaped makers without stopping. The markers can be any shape, colour or size and the back single marker can be a longer or shorter distance from the two front markers. Many thanks to Elaine for permission to post this. command at the back marker. Back Marker - Run Through Sendaway ..
Photo shows a 'run through' type sendaway with back marker (row of orange cones and a white post back marker). This is a variation on the triangular type sendaway. The aim is to have the dog run in a straight line from the starting point to ideally lay centrally across the front of the back marker - in doing so the dog must also run through the centre of the 'alley' of other makers without stopping. The markers can be any shape, colour or size and the back markers can be a longer or shorter distance from the front markers, there can be more or less markers than in the example used. This Back Marker run through sendaway would be the same principle as shown in the video below for a single marker - but the dog would obviously run through an 'alley' of markers before getting to the back marker. Back Marker - Single Marker Sendaway .. The aim is to have the dog run in a straight line from the starting point to ideally lay centrally across the front of the single back marker. The marker can be any shape, colour or size and can be a short or long distance from the starting point. on command at the single marker. Box (no back marker) Sendaway .. In this example the aim is to have the dog run in a straight line from the starting point to ideally lay in the centre of the marked out 'square' area - in doing so the dog must also run through the centre of the two front makers. The markers can be any shape, colour or size and the back markers can be a longer or shorter distance from the two front markers. Run Through (no back marker) Sendaway ..
Photo shows a 'run through' type sendaway with NO back marker (with assortment of markers to run through). This is sometimes considered the hardest type of sendaway as there is often nothing to 'draw' the dog to keep it going until commanded to lay down. It tests the dogs nerve and conviction to keep running over a long distance in a straight line until instructed to stop. The aim is to have the dog run in a straight line from the starting point to ideally drop (lay down) in an unmarked area - in doing so the dog must also run through the centre of the 'alley' of other makers without stopping. The markers may be less or more than in the example and be any shape, colour or size - the drop area can be a longer or shorter distance from the other markers. The 'Sendaway' exercise begins with the dog sitting beside you (on your left side) - you will be directed by the ring steward to the starting position and they will wait for you to set your dog up beside you. During your set up time you get your dog to look at the sendaway as per your personal set up routine for the exercise - the dog has to wait beside you after you have set it up - once you are standing up straight the ring steward will assume you are ready and will start to instruct you as below. Only a command OR signal (and dogs name if you want to) can be used at the start of this exercise, extra body signals, head movement during the exercise will mean loss of points. You cannot touch or verbally encourage your dog during the exercise. ... So; you can now touch and verbally praise your dog for doing the 'Sendaway and Call Up'. What You Might Lose Points for During the Sendaway and Call Up ..
All judges marks are 'graduated' according to the severity of the fault. So any part of the exercise might be marked 1/4 of a point if a minor fault occurred or substantially more if a major fault occurred. All the individual faults marks are added together to give the overall score for the recall exercise. You may also lose marks for intentional or unintentional body signals (hand, arm, head, shoulder movements). The Call up will be judged as per the 'A Recall' and 'Heelwork' faults.